Heartworms, also known as Dirofilaria Immitis is a nematode parasite that is transmitted by mosquitoes. Heartworms are only transmitted by mosquitoes and nothing else is the carrier of this worm. After the infected mosquito gets into touch with the host, the parasite resides in the pulmonary artery and the right atrium. These worms are responsible for many diseases including lungs and heart failure if goes untreated. It is always recommended to keep your canines on heartworm preventives like Heartgard Plus and Revolution to keep them safe from this lethal infestation. Before going for the preventive treatments it is advised to get your furry friends checked for the heartworm infestation, and start with the doses only if the test results are negative. However, what if the test results turn out to be positive? The veterinarian will suggest you to get your pooch treated for heartworm infestation, in case he tests positive. There are various things that you may need to take care of before and after the Adult heartworm treatment in dogs. 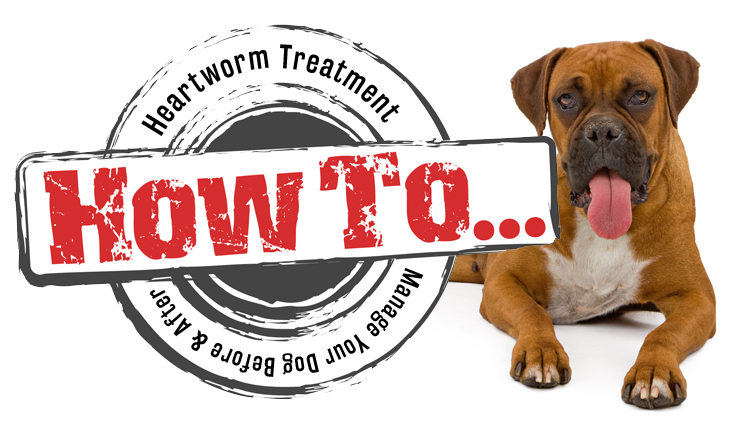 Let’s have a clear picture on how to take care of a positive tested heartworm infected pooch! Adult heartworms make way to lungs through the arteries and this is how they cause lung and heart problems in dogs. If your pooch is infected with adult heartworms, he should not exercise at all. The inflamed lungs could worsen if your dog is introduced to any physical activity. Moreover, he would be strictly crate confined for an entire month after treatment. It is better to get them used to the “no exercise, only rest” thing before hand. So, before going for the heartworm treatment, keep your pooch low on exertion. The patient is to be confined in the crate for one month. He must not be allowed to walk for more than five minutes. No running, jumping or playing during these days. They should be on leash when taken for urinating or defecating. You need to visit your vet as suggested. Do not miss on the medications and follow all the instructions given by the vet. Watch for signs like coughing, inappetence, lethargy, fever and nose bleeds. If you observe of these symptoms in your pooch, consult the vet immediately. In all, it is very important to take care of your heartworm infected dog before and after treatment. Follow these tips to avoid any complications while getting your furry friend treated for heartworm disease.